I pointed this out a coupld of weeks ago: when Obama said, “We’ve got more than a million unemployed construction workers ready to get dirty right now,” how exactly was that not the same damn thing as saying “We’ve got all kinds of shovel-ready projects”??? This is the exact same pork-laden boondoggle that massively failed three years ago. Obama is even using the exact same arguments to try to sell it. The only difference is he’s expressing the exact same arguments with different soundbites. Amazingly, rather than work with Republicans to come up with a solution that could actually pass, Barack Obama NEVER ONCE picked up a phone and tried to talk to Republicans AT ANY TIME prior to his so-called “Jobs Speech.” He is a naked demagogue, and it is long-past time the American people realized that he is utterly naked of ideas that will do anything other than seek to get himself re-elected. When it comes to putting people back to work, Illinois is going backwards. 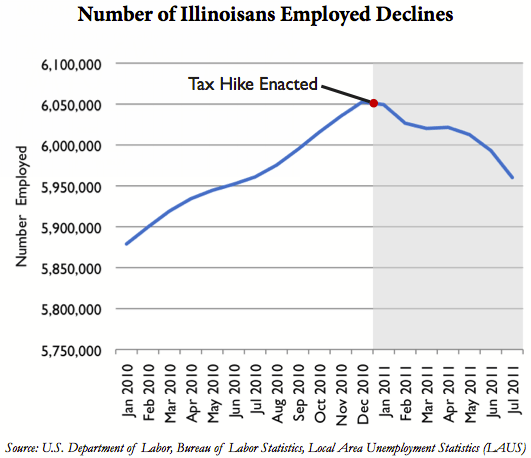 Since January, Illinois has dropped 89,000 people from its employment rolls. A combination of high taxes, overspending and red tape do nothing but chase away job creators and leave too many citizens without jobs. Springfield needs to act now and reverse course. Inquiring minds may also wish to check out the foreclosure pipeline in Illinois, 7th worst in the nation at 128 months (over 10 years). See First Time Foreclosure Starts Near 3-Year Lows, However Bad News Overwhelms; Foreclosure Pipeline in NY is 693 months and 621 Months in NJ for more details on the mortgage mess everywhere. Please listen to CEO of the Illinois Policy Institute John Tillman on WLS AM on the Fiasco in Illinois. It is an excellent interview that gets much better as it progresses. A tip of the hat to John Tillman for an excellent, must-hear interview. I have little to add to this miserable report other than to emphasize Pat Quinn is the worst governor in the nation. He will not be re-elected. Unfortunately, taxpayers will suffer the consequences of his stupidity for the full length of his term. If you want to get out of this economic malaise, elect Governor Rick Perry of Texas. Rick Perry and conservative Texas created nearly half the jobs in the nation since our so-called “recovery” began. Because the former Senator from Illinois simply doesn’t have the faintest clue about what the hell he’s doing. Do you want America to be more like Texas or more like Illinois?